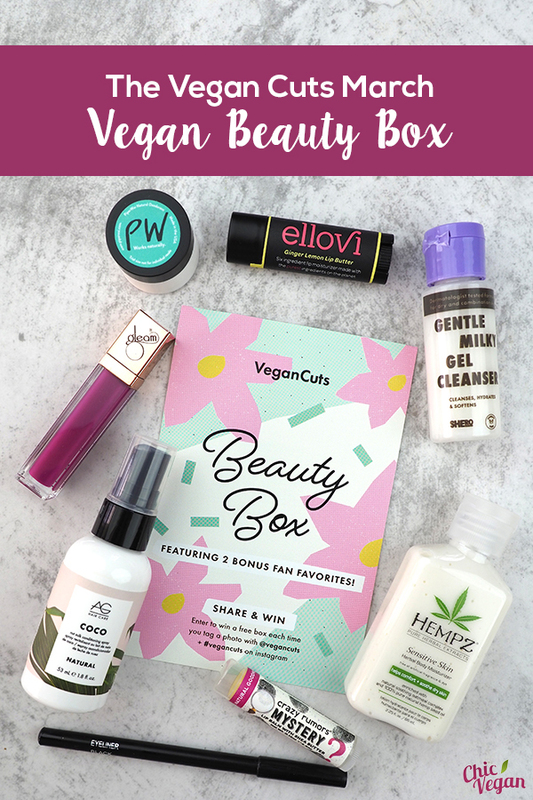 Spring is here, and the March Vegan Cuts Vegan Beauty Box will help you get into the swing of the new season with cruelty-free skin care products and cosmetics. 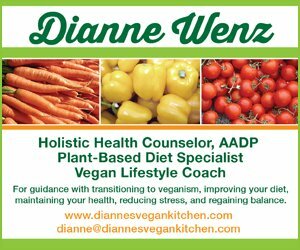 Most chic vegans are familiar with the Vegan Cuts Vegan Beauty Box, but if you’re not allow me to introduce you! 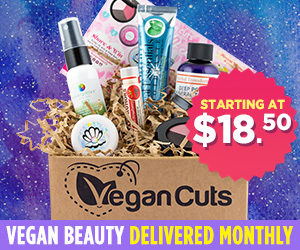 The Vegan Beauty Box is a subscription service that delivers a box of cruelty-free beauty products to your door each month. You never know what kind of lotions and potions you’re going to find inside, but it’s guaranteed that everything will be vegan. Most of the products are all natural, too. 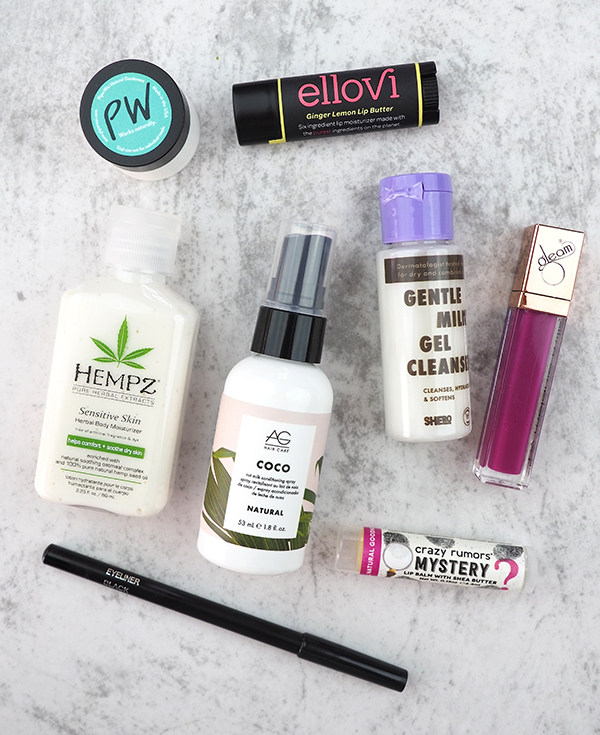 Products can be full sized, such as this month’s Crazy Rumors lip balm and BaeBlu eyeliner, or they might be trial sized, like the PiperWai deodorant and Shero Science cleanser. 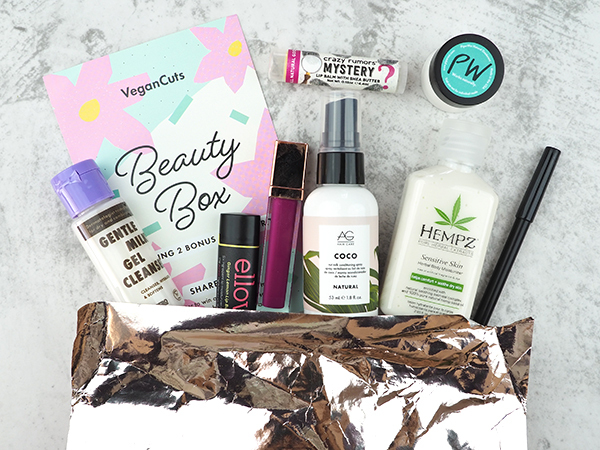 A subscription to the Vegan Beauty Box means you’re always able to try new products and discover new brands without spending a ton of money. 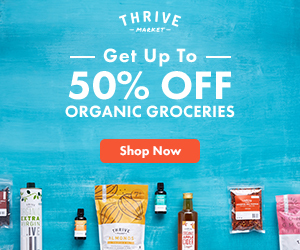 After a long, cold winter, my skin and hair have been a little on the dry side lately, and thankfully, the March box is chock-full of products to help smooth and moisturize. 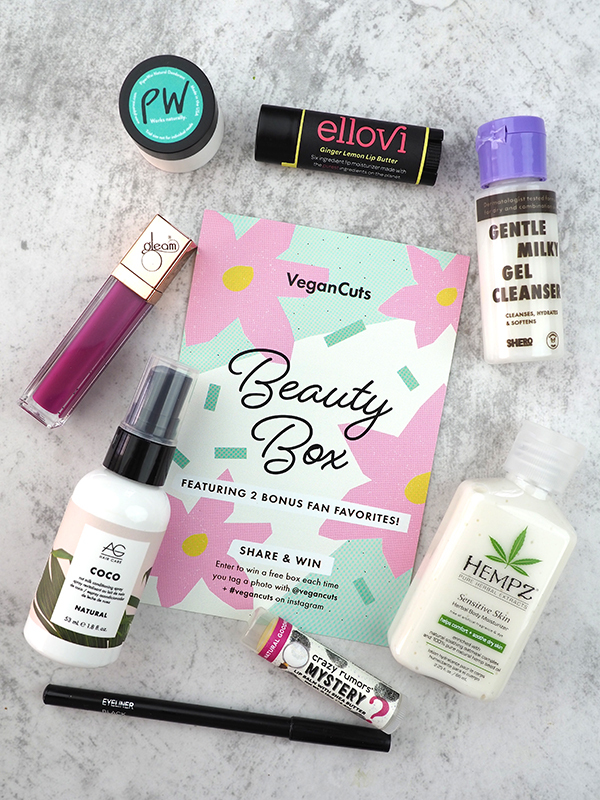 In addition to the six regular products, this month’s Vegan Beauty Box came with two bonus fan favorites from previous boxes! I found Gleam Lip Radiance and Ellovi Lip Butter in my box. My hair has been a little dry lately (thank you, winter weather), especially the ends. This coconut milk leave in conditioner has been a big help in adding moisture and detangle without weighing my hair down. To use, you simply spray it on wet hair and then style as usual. It’s formulated with coconut oil, coconut fruit extract, macadamia extract and mango seed butter to nourish and strengthen hair. 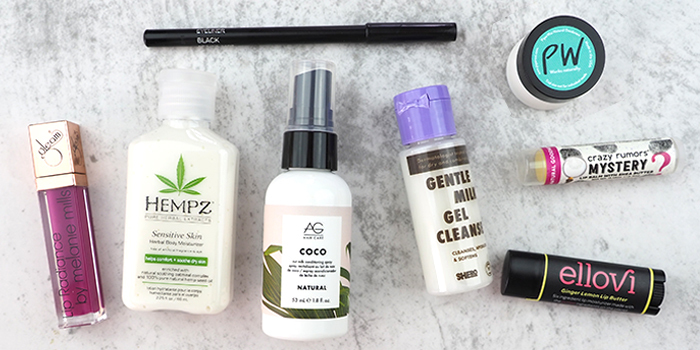 I’ve discovered Hempz lotion through the Vegan Beauty Box, and I’ve become a big fan. It’s sooths my dry skin and helps with the rough patches on my knees and elbows. This sensitive skin formula is free of added fragrance and dyes, which I really appreciate, because some scents can give me a headache. Enriched with pure hemp oil and plant extracts, it’s helping to revive and rejuvenate my tired skin. 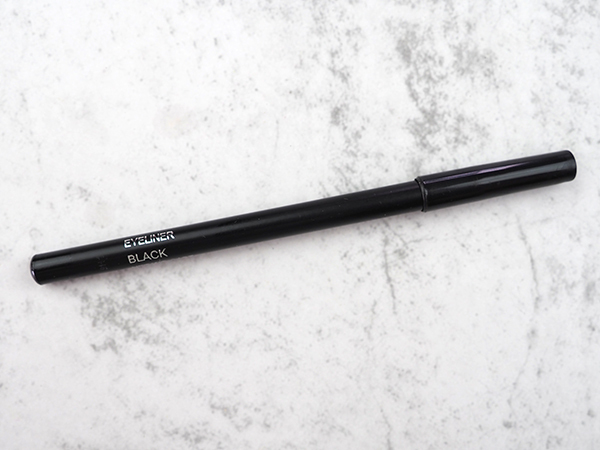 This smudge-proof pencil eyeliner glides on smoothly and stays put for all-day wear. It’s highly pigmented and creates instant definition. 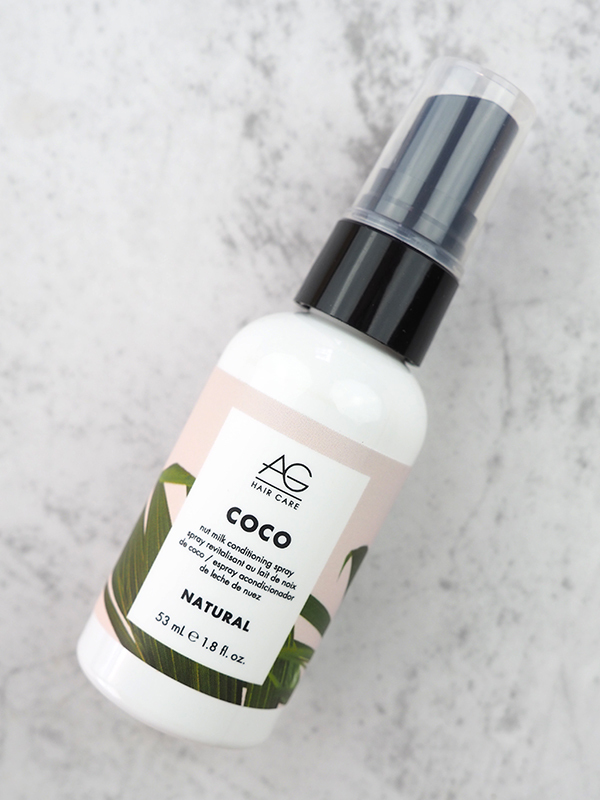 Made with natural ingredients such as jojoba and castor oils, it’s free from the harmful ingredients you’ll find in other cosmetics, such as parabens and formaldehyde. I love all the creative flavors that Crazy Rumors creates. I’ve been using this “mystery flavor” for a week now, but I still can’t put my finger on what I’m tasting. It’s a little fruity, a little sweet, and a whole lot of yummy. It reminds me a little bit of bubble gum, but it has a hint of berry to it. 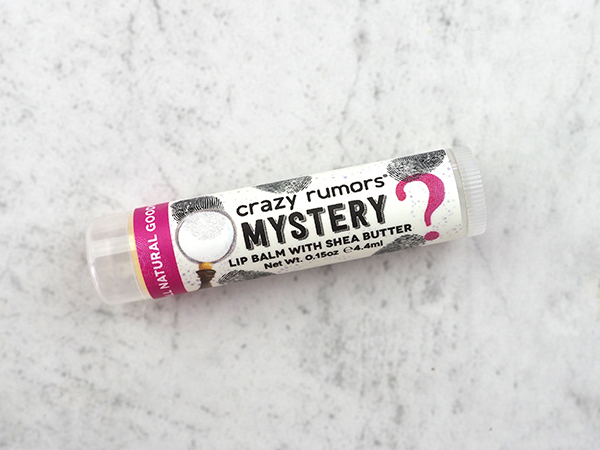 Crazy Rumors lip balms are made with organic shea butter as well as plant oils and waxes. Of course, they never contain any beeswax, which seems to be so prevalent in lip balms. This silky-smooth cleanser removes dirt and makeup without stripping the skin of moisture. It was created in partnership with a dermatologist and formulated especially for dry and combination skin. It contains vitamins E and B5, to replenish and heal dry, damaged skin. 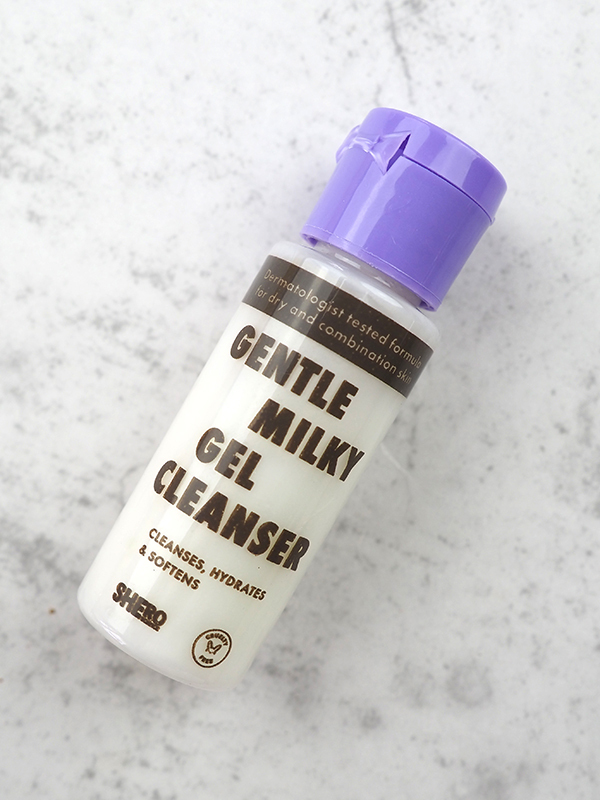 My dry, sensitive skin has loved it! My face feels silky smooth after washing with it. I’m a sweater. I can work up a sweat sitting still in a chilly room. So, deodorants are always a must for me. Natural deodorants don’t always do the trick, as I can often smell myself after a few hours, and the baking soda that so many of them use irritates my sensitive skin. While this deodorant does contain sodium bicarbonate, I haven’t experienced any irritation, thankfully. It also contains witch hazel and charcoal, so it’s kept me dry and stink-free! 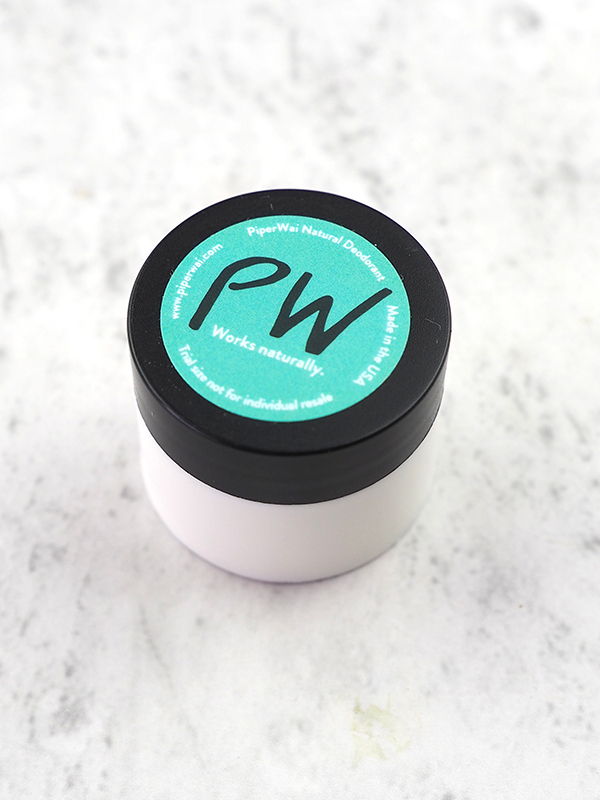 It’s free of the aluminum, parabens, and synthetic fragrances that so many other deodorants contain. To use, you just rub a pea-sized amount under each arm. I received this ginger lemon lip balm in my Beauty Box a while ago, and I’ve recently finished it, so I’m happy to receive another, especially after dealing with dry lips all winter. 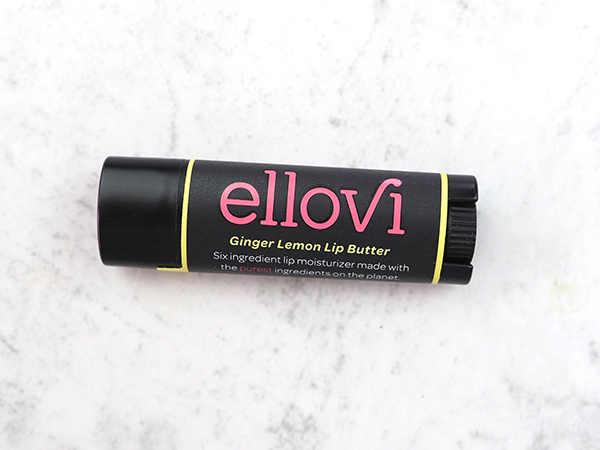 It’s made with just six ingredients – sunflower, macadamia, Hawaiian coconut, African shea, lemon, & ginger – and it has kept my lips hydrated all day. 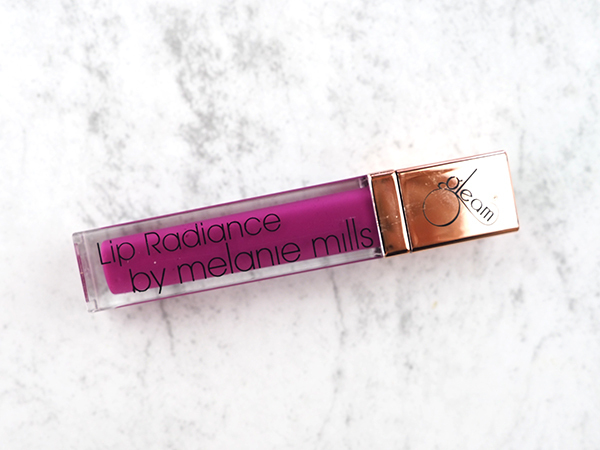 This long-lasting gloss is another Beauty Box fan favorite. It’s infused with natural botanicals to help improves lip texture while adding color. 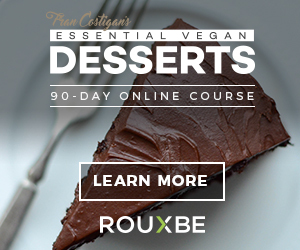 It’s made with a blend of natural ingredients including Vitamin E, jojoba oil, and aloe vera. It’s formulated to prevent feathering, and it doesn’t feel sticky on the skin. Great post – it looks like this box had some nice products in it! As I am on a journey to live zero waste, I have been experimenting with a bunch of natural deodorants. This one I haven’t heard of yet (I might have to give it a try). Thanks for sharing!